CourtConnect pairs a judge and a lawyer and equips them with a “presentation in a box” to visit a community group and make a brief presentation - an hour or so - about the courts and the rule of law. The goal of the program is to help forge a better connection between the community and the legal profession by putting a personal face on the justice system and making the courts more approachable, and hopefully to remove some of the mystery surrounding the courts. The program also helps further the court’s goal of increasing procedural justice - the concept of ensuring fairness and transparency of the processes by which decisions are made, treating all participants with dignity and respect, and ensuring they understand the proceedings and their rights - by opening the doors of discussion between the public, the bench and the bar. The MBF invites you to learn about CourtConnect, its newest outreach program, and to consider this occasional volunteer opportunity. You commit to one weekday or weekend morning or evening on the schedule to present. You are given a box with everything you need for the class - a script, handouts, cookies, etc. Plan to arrive a few minutes early so you can talk to your co-presenter about how you want to present. The regular course instructor will also be present to introduce and help get the class going and to answer any questions you have. You can follow the script or use it as a starting point and let your class guide you based on their questions and experiences. For new attorneys, think of it as a practice voir dire type of experience. For those who have been practicing awhile, take the time to really listen and learn from people who come from diverse backgrounds and sometimes, from all over the world. If you are interested in being a presenter or having CourtConnect come to your community or student group, please contact Pamela Hubbs (503.222.3275, pamela@mbabar.org). Why be a CourtConnect Presenter? "Educating the public about the role of the courts is our responsibility as lawyers and judges who are its stewards. Members of the community often lump the courts, law enforcement and politics together. As we know, the judiciary is a crucial part of our system of government. 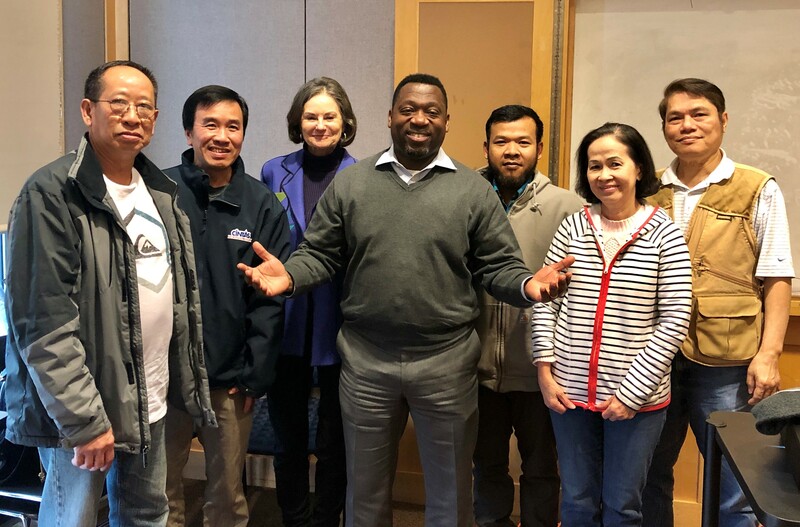 MBF’s CourtConnect program provides an opportunity for us to remind the broader community of that important role and share Multnomah County Circuit Court’s commitment to fairness." "Being a presenter is fun and fulfilling while not requiring a large time commitment. The MBF provides a helpful outline/script that you can use as a guide; thus, you won’t need to draft any materials or spend a large amount of time preparing for the presentation. And by agreeing to volunteer you are not locked in to a long-term commitment; you can do as many, or few, presentations as you would like." "Our legal system can be difficult to understand even as members of the profession. That complexity must be all the more magnified for people new to our nation, and frequently coming from conditions where the legitimacy and accessibility of the legal system is not what we are fortunate to experience here. Even given those underlying issues, our group was engaged, inquisitive, and most impressively from my view, hopeful. They had a sense of ownership in the justice system as a part of their new lives in this country. It is easy to become frustrated, and rightfully so, when our system operates in a way that does not further the interests of justice. 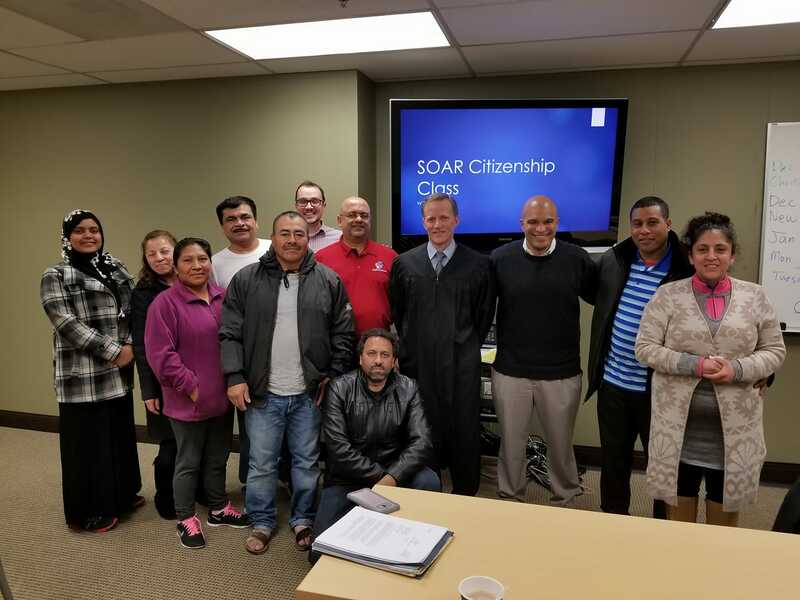 But on a night like the one I got to experience at SOAR the ability to play a small part in allowing a group of new Americans to gain some insight and understanding into how the legal system operates to ensure the guarantee of their rights was an experience I will forever be grateful for." "The class size is small so you have this amazing opportunity to get to know aspiring citizens and to answer their many questions about the difference between our legal system and the ones they came from. When we do our work as attorneys, we sometimes forget about the basis of our judiciary and the jury. Teaching people about the jury and the way our laws are implemented and enforced reminded me that we truly have the best system in the world. It allowed me a rare opportunity outside a courtroom to provide my knowledge and experience to people who would not otherwise have access to meet judges and attorneys in a positive and welcoming environment. We are lucky to have so many judges, like Judge Dahlin, who are committed to engaging directly with the community. I think this is a great opportunity too for all attorneys to work together with our judges to provide education to our new citizens."